This was my first race that I trained without the Hal Higdon training plan. I always used his plans as the base of my training, and always felt let down and unprepared by the time my race came along. I decided this time around that I wanted to try something completely different and see if I saw any changes. After doing some research, I finally landed on the Runner's World 10-Week Sub-1:50 Half Marathon Plan (talk about a catchy title, right?!). Since my goal was just to break 2 hours, I modified the plan a bit to make it a bit easier for myself, and added in a few 5k races. The biggest difference between the two plans is the mileage. In the Hal Higdon Intermediate Program, the plan tops out at 29 miles, but gradually grows to that number. In the Runner's World plan, the peak week is 43 miles, but the weekly mileage is really sporadic and there is no real rest week besides week 9 (which is the only week below 30 miles). 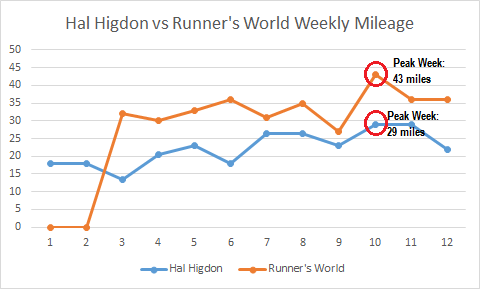 Even though the Hal Higdon plan is 12 weeks and Runner's World is 10, there is a huge difference in total miles (267 vs 339). Pro: There are a lot of double digit runs. When I reflected on my last half marathon training, I mentioned that I didn't get in enough long runs to feel confident. This plan has lots of long runs over 10 miles, so I really liked that and got comfortable with the distance. My longest run was 11 miles, and I think next time I'll push it and have a long run of 12 miles. Con: Each week is really tough. In most plans that I've seen, there are typically two buildup weeks followed by a lower mileage/cutback week. In this plan, it seemed like each week was just as tough as the previous week. I did have to lower some of the mileage when I had races scheduled, so I modified the plan to fit my schedule. This worked out really well, and I think it helped prevent injury. Pro: The speed work was challenging and interesting. In Hal's plan, there are only two types of speed work- 400 meter repeats and tempo runs. The Runner's World plan had tons of different workouts that really pushed me and made me excited. My favorite workouts during this plan were the 2 mile repeats, which really pushed me physically and mentally. I think this made the biggest difference! Con: No tempo runs. I mentioned this before, but I do wish this plan had tempo runs. I added in some fast finishes to my long runs, but having more runs at my goal pace would have been really helpful. I think next time I will add in a few tempo runs to replace some of the "steady state" runs. Pro: High weekday mileage. I really loved doing 5-7 mile runs during the week. This is my favorite distance to run, and it always seemed like the Goldilocks of running- not too short, and not too far. I ran most of these runs before work, and it was a great way to start my day. I think these runs improved my endurance and made the longer distances seem much more manageable. Con: Not many rest days. My biggest complaint and problem with this plan is that there are barely any rest days! In Hal's plan, you're running a maximum of 5 days a week, and most of those runs are at an easy pace. I missed having those built-in rest days, as well as days dedicated to cross training. Going forward, I'll re-evaluate the training plan to add in at least one rest day each week, and see which days I can add in my cross training. What is your favorite training plan? Why? Do you like to cross train? How do you balance that with getting enough miles in? Loved reading this review. I've always used Hal Higdon plans as well, and managed to run sub 2 on my first HM, but haven't made much improvement in the several years since then. It took me 4 years to PR again, which was frustrating. I did like the variety of speedwork your plan seemed to have. I wonder to myself sometimes, why am I running 400's to prepare myself for 13.1 miles? So more "speed work" at race pace I think is something that would benefit me. I have Buffalo Creek this weekend and then nothing definite until the Pittsburgh half in May. Something else may sneak in there, but I think I'll dedicate some time to mixing & matching plans to make a more custom one for myself. Oh, and CONGRATS on your PR! That's great to hear! I was always curious what plans you used for training since you made such big improvements in your times! Thanks for letting me know. And I'm still excited too!! hah! I'll have to figure out that balance next time around! I think customizing your own plan is always best. I have only ever followed HH plans when training specifically for half marathons, but my best half marathons have been run while training for marathons (one on HH intermediate 1 marathon and the other was Pfitz 18/55 from Advanced Marathoning). I tend to have more speed than endurance, so running higher mileage seems to be really helping drop my half times (I averaged about 45 mpw leading up to my most recent half, and it was a 4 min PR). I'm hoping to focus on improving my half next year, but I'm not sure which plan I will follow. I might end up creating my own plan. I have the same problem...my 5k times indicate that I should be running a much faster half, so that's something I definitely tried to work on! We're very similar runners I think (except that you're MUCH faster!) I can't wait to see what plan you come up with! Yup, I totally agree with you re Hal Higdon plans. They're very conservative, and honestly? The best way to get better at something is to do it more. That's the trickiest balance to find especially for new runners, is adding enough mileage on to improve running economy but not tooooo much that injuries crop up. It's very tough to balance that out. You're obviously very in tune with your body which helped you improve over the weeks without getting injured. Whatever schedule we follow it's always so important to not be completely rigid about it. Anyway, I'm nattering on here. I love talking running, can you tell? HA! This was a great review! I used Hal Higdon for my first marathon (I think) but always end up modifying the plan somewhat. Thanks Emily! Modification is key! I have trained with the Runners World Big Book of Marathon Training. They have three half and full marathon training plans. I loved them. They were very good building blocks for me! I have that book as well! I'll have to check out the plans in there..thanks for the suggestion! thank you for this review as I always wondered about their plans. I have never followed a specific training plan so this is interesting to me! I wish I could just run without a plan...I'm useless without a schedule lol! super interesting to read this fabulous review of your training. thanks for sharing! So glad you liked this Kirsten!! Thanks so much for the review! I have been curious about your final thoughts on the plan. It clearly was a great plan for you! I think I would like this plan too. There are many similarities with Hansons--higher mileage, higher weekly mileage, many double-digit long runs. Finding the time for cross-training is also my biggest challenge. Oh, and I will be running the Turkey Trot too--with Django. He doesn't know it yet but he's about to start a Dog Bed to 5K plan. :) Have you considered running with Selma? I think you definitely would like it as well. The big difference is this one is really short - only 10 weeks! I would love to run a race with Selma some time, but she needs a lot of work..both with pulling too much and with endurance. She's so out of shape and kinda pudgy lol. Love the dog bed to 5k...so funny! I bet Django will love it and I will cheer for you guys for sure! That is a lot more mores! I guess you get what you put into it. Congratulations on the race and this review was very interesting! !